Join us at what has become PCA San Diego's home track for the first of three great weekends in 2018: Chuckwalla Valley Raceway, Saturday & Sunday, January 27 & 28, running clockwise. January is the high season in the low desert, and usually provides nearly perfect driving weather. Be sure to carefully read everything on both this page and the next before signing-up so that you aren't shut out! By the way, if you participated in our 2017 events, be sure to register now for the Driver Awards Dinner! Season Pass: For those TT drivers who plan to run with us all season long – see our complete schedule here – we again offer the Season Pass at no up-front cost! Track rental rates have been rising each year and yet we have not had a significant price increase in several years. In fact, in 2013 we LOWERED PRICES for early registration (defined as at least 2 weeks prior to the event), providing drivers that register in a timely fashion with the same prices they paid back in 2007. Even with continuing increases from some of the tracks SDR is holding tight on prices yet again for 2018, but with a Season Pass you can get an even better deal and an awesome free gift! Sign-up for the Season Pass with this event, then simply pay for and attend all days of all of our TT events this year (TT'ers may skip up to 4 event-days, and registration in the Club Race portion of a joint SDR TT/CR event qualifies as attendance) while receiving $25 off the then-current online price of each multi-day event ($10 per single-day event, if offered; note that it is your responsibility after signing-up to claim the Season Pass discount at each event – it isn't automatic). And Pass holders with a Zone 8 Solo Permit are guaranteed a spot regardless of when they sign up (so no need to wake up early on the Sunday morning that a registration opens!). Student Pass holders automatically receive priority when registering for events (processed first for new events, and moved to the top of the Waitlist for any event they sign-up for that is full at the time). All Pass holders also receive an exclusive free gift just for signing-up. The PCASDR Glacier® Soft Shell Jacket will keep you warm in style on those cool track mornings and bears the SDR logo. Combined with early registration prices for events, with a Season Pass you'll be paying what we charged way back in 2003 for SDR events! You will not be charged anything up-front and will be entitled to the above discount at each SDR-managed TT track event in 2018 including the California Festival of Speed. If you miss more event-days than permitted, you will be back-billed for the cumulative discounts you received plus $100 to cover the cost of the gift you received. Complete details will be sent to you after you sign-up and you may opt out at that time with no cost or obligation. It's simple, costs you nothing, gets you an exclusive free gift, and potentially saves you $175 over the course of the season! Note: the design above is for illustrative purposes only and may be different than the actual production item. You must sign-up for the Season Pass by January 1 in order to guarantee your gift availability. 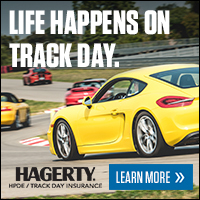 Physical Damage Insurance: Insurance for your car is available for this event via Lockton Affinity, LLC, PCA's exclusively endorsed insurance provider. Note that liability coverage is not included and Time Trial Timed Runs now appear to be insurable for an additional charge. This insurance is strictly optional. Be sure to read all the fine print. For more info click here and search for Chuckwalla January 27-28. Lap Times and Event Info on your Mobile Phone: You may sign-up for our mobile phone timing and notification system as part of your registration for this event. 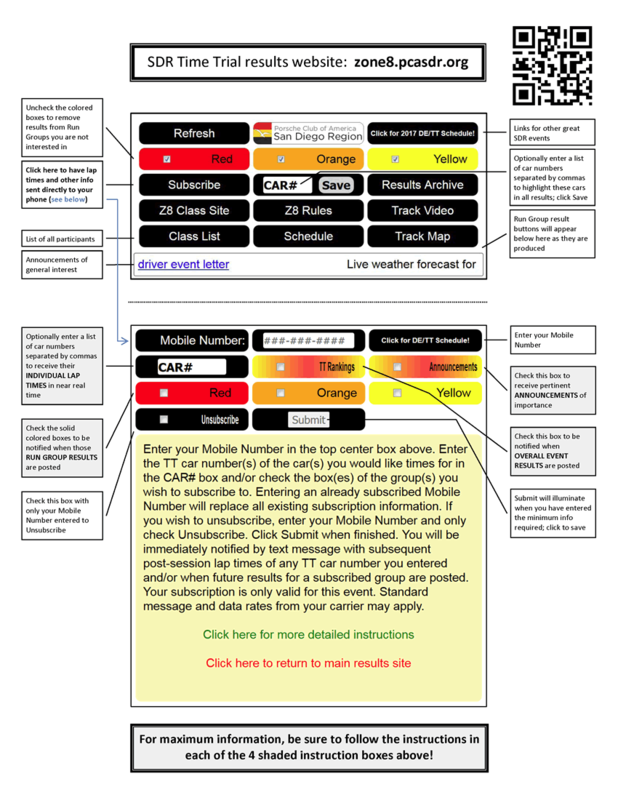 For a Standard subscription (lap times for your car, notifications of postings for your run group, and important announcements), simply check the box that says you do not want a Custom subscription. Even if you do not wish to take advantage of this service, you MUST have your mobile phone number on file with MotorsportReg in the Mobile/Cell field or your registration will not be processed. Having your mobile number in any other field while leaving the Mobile/Cell field blank amounts to not having your mobile number in the system. Again, your registration is not valid until this has been completed and others registering after you will be prioritized ahead of you. To check or input this, sign in, then click the “My Account” tab in the Dashboard, then click “Edit profile”, then click “Edit My Information”. Enter your mobile phone number into the field titled “Mobile/Cell” – even if you already have it in other fields – then click “Save My Information”. Late Registration: You must register with credit card on file by 11:59 pm January 12 to receive the discounted online rate; after that a $50 late fee applies through January 21. Online registration closes at 11:59 pm January 21, after which even higher on-site registration fees apply (though space is unlikely to be available at that time).